Mexico Beach, Florida, just 20 minutes east of Panama City, is easily accessible by car or air. Located on a pristine stretch of beach in Bay County, Florida, Mexico Beach is Florida’s best choice for travelers who are in the know and seeking a genuinely quiet white-sand beach vacation destination. Mexico Beach is located just 20 minutes east of Panama City, and an hour east of the Destin / South Walton area. It’s a great day trip for vacationers seeking serenity and seclusion. Simply drive east on Highway 98. You will enter Mexico Beach shortly after passing Tyndall Air Force Base. 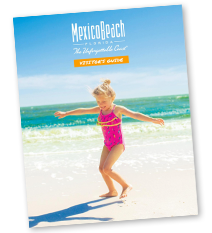 Air travel to Mexico Beach, Florida, is by way of the new Northwest Florida Beaches International Airport (ECP) located in Panama City Beach and just a one-hour drive away. American Airlines, Delta, United Airlines and Southwest Airlines offer flights arriving and departing daily, with many direct flights from major cities.